What about the little kitties? Is there a source for them? 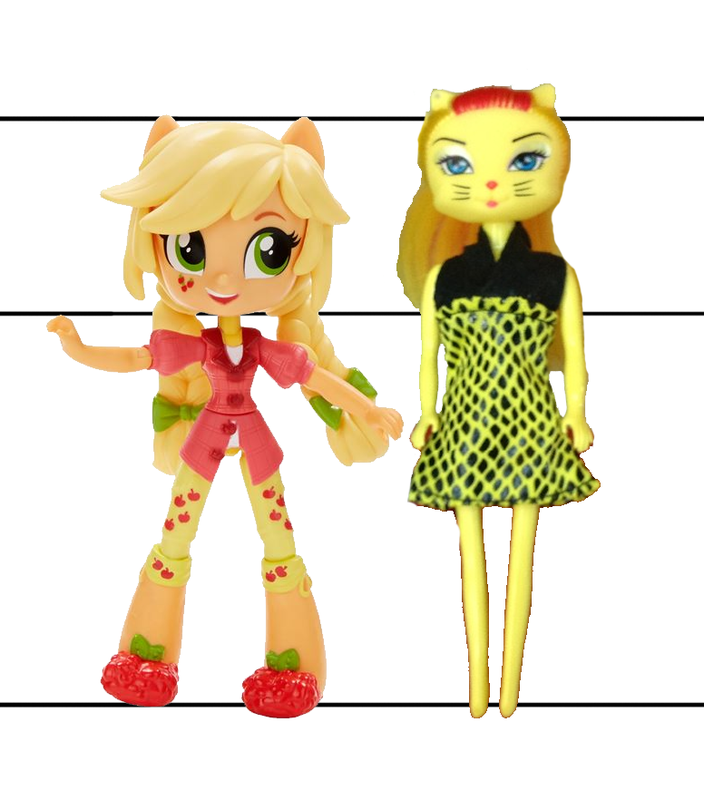 Now the only other question is if Equestria Girls Minis bodies work for these. Minis are about the same size from bottom of the feet till ear tips. The body is around 3.15 inches tall. The neck might need some modding to hold the fakie head. Wuvmykitties! I've been searching for you! I have a customized Fakie doll that I want to gift to you if you'll let me. I feel like you'd give her a good home. Or, if you prefer, an uncustomized fakie. I kinda went nuts at Dollar General. I mean, if you're interested. Like I said, gift. A very rough estimate between a catwalk mini and EQ mini. I based it to the measurements provided and to the picture Loona had earlier posted. I think the kittie head could be bigger than I pictured here. Also EQminis don't have the same style neck joint as fashion dolls. You'll most likely have to cut into the head. It depends on the fakie. I will PM you. Maybe I should merge these comments but I wanted to keep this specific comment apart from the one with pics. Have any of you fellow fakie fans thought about the toxicity of counterfeit MH dolls? Honestly I never did until today, but I don't mind to be honest because I don't think all the fakies have and even if they did it would be in small %. or at least that's what I wanna believe. Finally a new colour Avea! 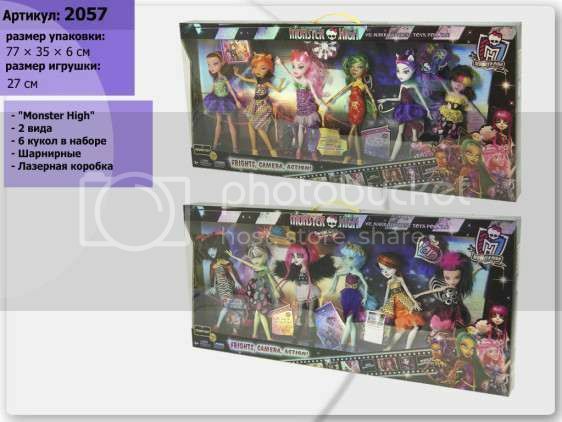 It could be given a Abbey head and the white clawdeen head could be sold for a nice prize. BUHAHAHHAA!!! Fakies are cheaper because they are made off cheaper likely more toxic ingridients and don't usually go through safety regulations that regular MH dolls go through. Thus it is possible for them to be toxic. Some shouldn't actually be marketed as toys so that's why a lot of fakies are sold at fleamarkets. That Frightmare does look like an Avea fakie. Why does Russia get all the cool fakies? The "Inner Fashion" ones are creeeeeeeeeepy! (Porcelain doll creepy). 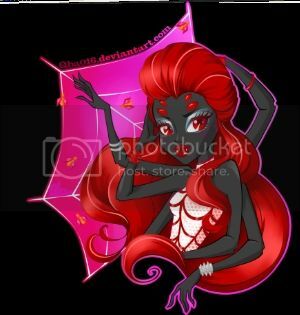 Avea frightmare is cute! but yeah, she needs a head swap. Either Abbey or maybe the CMC Sea Monster might be the better candidates(Or Una verse, to make her *really* freaky). 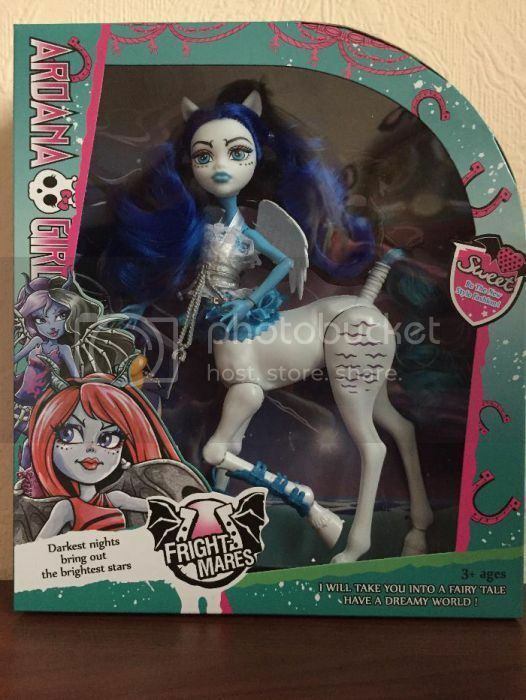 It would be interesting to know if the head is Clawdeen's, Avea's, or an enlarged Frightmare. I feel sort of bad for the person whose PAnda they stole... but that pack also has a fakie Skelita, so no gonna lie, I would get it. or the 3 eyed ghoul wouldn't that add even more freakyness to it?? So many head choices, but her own head is definately a Clawdeen mold. I wonder why they didn't use Aveas own head mold since fakey makers have used it before. Guess they're being stingy. Hokey smoke, I didn't even notice the Panda fakie! Now I REALLY want it!!! Dang you Russian stores!!! I did notice the manufacturer's name is (?) Dongguan Toy Factory in China. But I think you have to place a large order with them (grrr). I'm really sick of seeing them only available to one country.